23 January 2019. Wageningen, the Netherlands. Fifth Community of Practice (CoP) Youth meet-up. The purpose of this model and the brief is to propose a systems approach and to serve as a guide for those who are deciding where to best intervene or for their investments to have greatest impact on youth employment and entrepreneurship in agrofood systems. The participants of the CoP meet-up were invited to reflect on the draft framework. Does it capture the multiple issues and address the most effective ways to overcome the challenge of youth under- and unemployment? Does it expand youth entrepreneurial opportunities? Can it help guide meaningful interventions? Which suggestions are there for improvements? How can we move to (more) collective action on these issues? A dominant policy approach to youth un- and underemployment has been the funding of skills-building programmes that seek to enhance the employability of young jobseekers. Also a number of behavioural change for activation, mentorship, incubator and entrepreneurship programmes are being developed and implemented. Many of these interventions are based on the assumption that young people are either insufficiently equipped or not sufficiently motivated to support the agricultural transformation agenda. 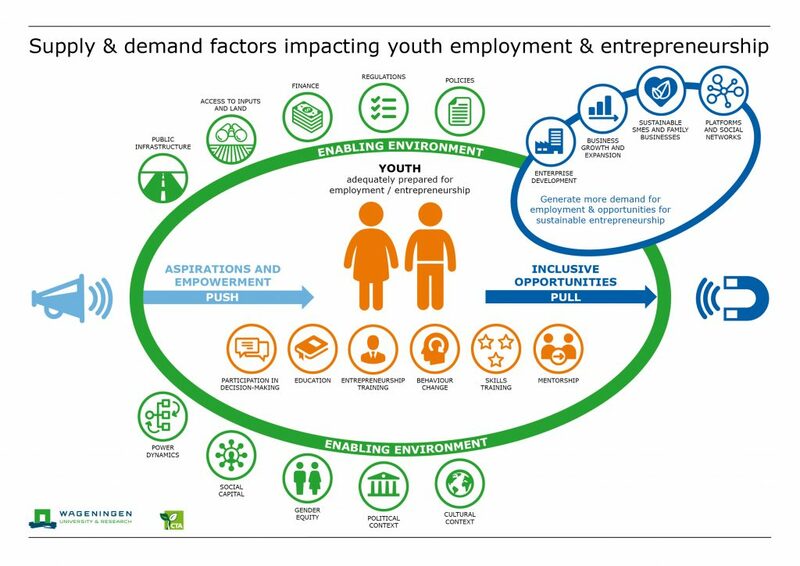 And these programmes suggest that markets do (or would) hold sufficient opportunities and empowering young people would suffice to enable them to enter these markets. However, still many questions remain as it is unclear whether, and under what conditions, the formal private sector generates enough and decent jobs. Policy actors are becoming more aware of the shortcomings of certain interventions, and attention is shifting to focus on how to promote productivity, boost the private sector, and generate the kind of growth that could create jobs. There is already a growing knowledge base and various guidelines exist, such as for “Making Markets Work for the Poor approach” (- see also the brief). These guidelines should be considered when developing a framework further. The model does not have to be perfect and it would be interesting to already start learning more about its use in practice. A systematic analysis of the relationships between the different parts of the model, and the outcomes of various types of interventions is still needed to develop comprehensive guidelines for facilitators and policymakers. Wageningen Centre for Development Innovation is going to test the model in three sector transformation programmes with youth components. CTA and WUR would like to invite others to do the same and test the model in their programmes and bring experiences together in a learning trajectory. Another idea is to create a mapping on who is doing what to stimulate further collaboration, synergy and partnerships. Focussing on only one or a few elements of the model will not sufficiently address the matter of youth employment and entrepreneurship. Partnerships are needed in order to follow the holistic approach that is required to achieve the ambitious targets.